Store cork sealed bottles on their side. This will help to ensure that the cork stays moist, preventing it from drying out and letting oxygen into the bottle. Store screw cap bottles upright. Since there is no cork, there is no need to store these bottles on their sides. Keep your wines out of direct sunlight. The back seat of your car or your kitchen window are definitely not ideal places to keep your favorite bottle of Castello wine. Light can be damaging to wines, altering their delicate chemical balance and potentially even heating up your wine. This is why the lights you see in our Library Rooms are dim and red, and also why most ageable wines such as Cabernet Sauvignon come in deep green bottles; the color of the bottle helps to prevent light rays from penetrating through the glass. Store your wines at a cooler temperature. Hot wine = cooked wine, which can be a sad sight to see (and a terrible thing to taste). You’ll notice heat damage to your bottles if the cork appears to be popping up from the bottle. Most wines are best kept around 55° Fahrenheit (13° Celsius). Keeping them cooler also helps to slow the aging process. Storing your bottles in a slightly humid environment (60-70% on average) is also helpful for preventing the cork from drying out at the end not in contact with the wine. If you don’t have a wine fridge or cellar, keeping them in a cool place out of direct sunlight, like a closet or a wine rack in the coolest part of your house, should do the trick just fine. Are a Cabernet Sauvignon and a Pinot Grigio capable of aging the same amount of time? Definitely not. There are certain characteristics of specific grape varietals, as well as how the wines are aged before bottling, that determines a wine’s ageability. The vast majority of wines available in the market today are meant for consumption sooner rather than later. 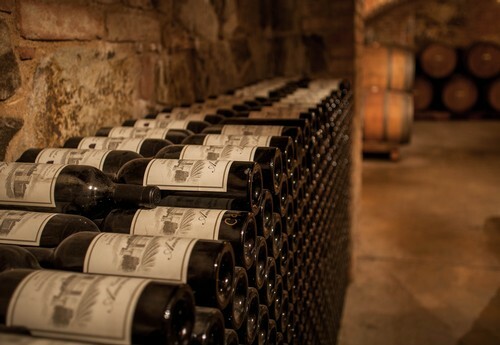 Some, however, absolutely benefit from some quiet time in the cellars. Bold red wines like our Il Barone Reserve Cabernet Sauvignon and La Castellana Super Tuscan blend are capable of long-term aging, typically up to 15 years from the vintage date on the bottle. This is because these wines have the structure capable of aging due to the tannins imparted from thick skins of the Cabernet grapes as well as the new French oak barrels they’re aged in. As the wine sits in the bottle, these tannin molecules are linking together and falling to the bottom of the bottle as sediment; which is often why so many younger Cabernets tend to pack a bigger “punch” than older vintages (and also why so many older red wines are decanted to remove the sediment). While these wines are fantastic to drink now, they can be even better after laying down for several years, as the structure of the wine smooths out and the tannins are allowed to integrate further. 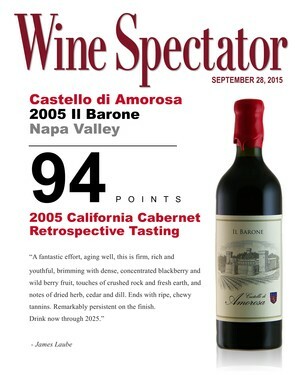 Our 2005 Il Barone was recently awarded 94 Points from Wine Spectator Magazine in a ten year retrospective tasting led by wine critic James Laube, which only helps to prove that those bottles of Castello Cabernet in your cellar are getting even more spectacular with age! Light-bodied white and sweet wines like our Pinot Grigio and La Fantasia are meant for drinking within the first five years from its vintage date. These wines are prized for their bright and crisp qualities; as they age these characteristics tend to fade. So if you’ve been hanging onto that bottle of 2006 La Fantasia, it might be time to pop that bottle before it’s too late! 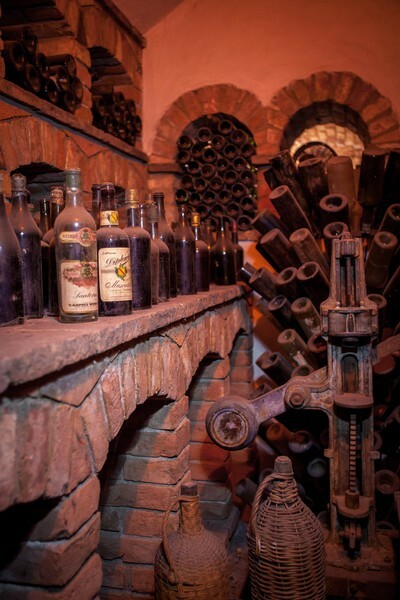 If you’re ever curious about how long to age your favorite bottle of Castello wine, check out our Ageability and Cellaring Chart, which shows the proper time, temperature, and storing positions for our premium and reserve wines. So whether you’re building your own Tuscan-inspired brick and frescoed underground cellar, or are simply looking to keep your prized Castello wines from cooking in the living room of your apartment, there are plenty of ways to ensure that you’ll be enjoying your favorite bottle at the best time, temperature, and place! Just be sure to drink them before they turn 100!